After the great day of the 14th March this last few days has been the best flying weather for quite some time. It started with the high pressure moving in from the Azores and creating the classic high pressure system ripe for the TVHGC sites. Friday Combe Gibbet: So on Friday we still had remnants of the low pressure system in the morning before the high moved in later in the afternoon. I hung around on Combe Gibbet in the hope of it dropping from the 25mpg winds I found on arrival. I knew it would settle at some point so sat it out watching many pilots fly overhead from Liddington during the day and wondering if I had made the wrong site choice. The conditions weren’t ideal at that time with big clouds and hail. So I was glad by the afternoon things looked up with the wind dropping and the sky looking much better. I set-up at around 3pm and met up with Lee and launched into reasonably strong winds and the conditions were still quite lumpy which is exactly what the clouds looked like. After 5pm things improved and we were delighted with some lovely smooth conditions with the odd thermal around. Height gain was about 1000ft above take off. I was enjoyable gaining something for the effort of the day. We packed up at sunset. Saturday: Helping out as TI with Cloudbase on Milk Hill White Horse. Great day lots of students getting through their EPs and most this was their first hill flight. 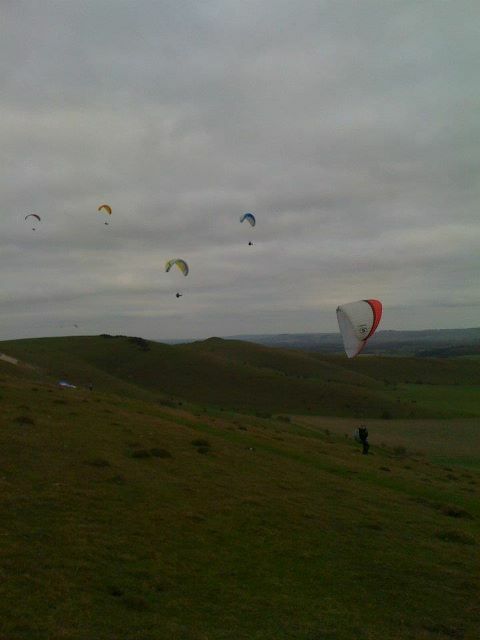 They were launching off the top of Milk Hill White Horse by the end of the day. Cracking day! It was great to also show the students the pilots flying overhead from Golden Ball on their various XCs. Sunday: “My First XC from Milk Hill albeit short 6km”: Back to Milk Hill after the morning actuals looked promising for a short morning get away. I arrived to the sight of gliders flying high but it looked strong. When I arrived at launch it was gusting 18-20mph but it was fairly consistent for at least 15 minutes. I met Craig Atwell on launch and we setup for a committed but quick launch and we were up and away. The conditions were fine out front but very sharp spiky thermals earlier which as expected got stronger. There were about 10 gliders in the air but with good lift and separation it was good to get out and seek the thermals. The best thermals seemed to be developing over the southerly escarpment and into the bowl. After about 30mins and at 11am I got a good 4mps solid climb that took me to about 1000ft above the hill and over the back quickly due to the drift but it was fairly solid. I met up with another orange glider above me (maybe Adrian T or Craig) over the back near Golden Ball car park but I couldn’t find the thermal or updraft so made the decision to leave and head on towards West Overton hoping to find something en route but nothing. The sky was still blue at this point and I found it difficult to find a source of another thermal. On top of this I was in 3mps sink and ended my flight at West Overton next to to a road. On packing up I hitched a lift with another paragliding pilot who was heading to Milk- result! And arrived to find the last gaggle leaving in a very established climb around mid day which I later found took many of them to Milton Keynes. What as sport… the learning continues…. Unexpected few hours flying on Rybury when the wind dropped for a bit. Very strong wind in the morning grounded all but a brave few and I had left but returned for a little lunch and banter in the gale for some reason ;-). So was very surprised that late afternoon it dropped and after waiting 40mins it was still light and we had sun. It was still strong aloft so was being careful not to get too high. Tricky day but the winter flying is paying off. 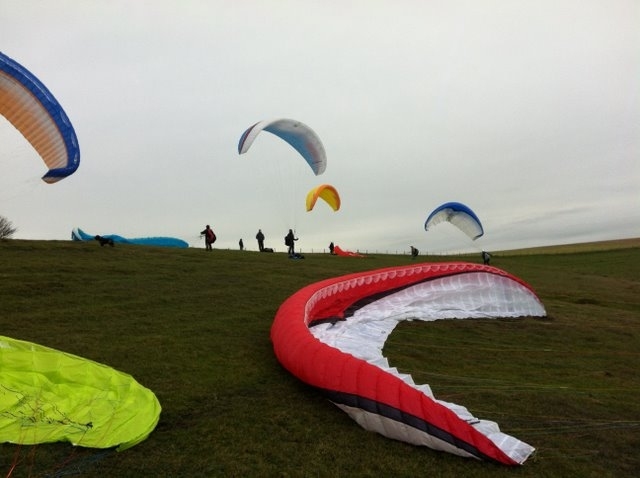 An early start up and thanks to Cloudbase Paragliding for use of Rudlers West Hill. Met Lee and the students at 9ish and headed up to the hill top. Nice if a bit light to start with for some soaring and then it became much stronger and pleasant. Met Wingman John on the hill and we continued to fly until it dropped off completely mid day. The wind eventually picked up again early afternoon and with a bit more cloud cover we headed up. It was a little thermic at times but not enough to turn in as yet. Good chance to fly way out from the hill and explore. Ended with a flight down to the track when it got too strong and a bit lumpy. A nice day and about 3 hours flying bagged. A wonderful, unexpected whole day’s flying on Milk Hill and Milk Hill White Horse. It was great to meet up with folks again after what seems an age of being grounded due to er….challenging weather. Gold stars to Theano Pitrakou for a great first post qualifying flight. Bagged another 2 hours of flying and lots of ground handling. Another lovely day out winching at South Cerney. The conditions were quite strong in the afternoon. Got a few flights late afternoon and a chance to try a few asymmetric collapses 30%. Met up with wingman John and he started his Tow Conversion course. With a rubbish forecast the day before and meant to be all blown out I had checked the late evening forecast and things were moving slower and looked like another small window to be gained. So headed down at 7.30am to arrive at 9am on Milk Hill and to a glorious sunny, blue sky scene, fabulous. However a rrived to find nil wind at the top so hung around guessing a few folks would be visiting soon. After an hour a few pilots arrived however still light we gabbed the gear and headed to launch. Suddenly the track resembled the M4 with almost 20 odd pilots joining the parawaiting party. Around mid day the wind picked up enough to launch but still not enough to soar more than a few beats so held off whilst ground handling. The front of launch resembled a fish tank with those trying to soar… far to busy for me I held off. The forecasted claggy top cover of a warm front slowly pushed in and cleared the hill a bit to allow me to grab a bit of flying before the drizzle arrived and shut down the flying. Great again to meet the usual pose and thanks to Lee for taking this pic. Arrived at Tan Hill around 10am and in thick fog as forecast. It was set to clear and held out. Met up with wingman John and we headed up around lunchtime to the top of Tan and later me up with a few others. We held off until the fog cleared later in the afternoon and by 2.30pm the sun came out. I had to leave early and therefore it was a short flight and then fly down to the barn and landing next to the car. Again it turned out a perfect soarable afternoon for those who flew.